Cows kill more people than sharks. This is a well-known fact. Another fact? We’ve updated our website and are making lots of changes around here. You’ll soon be able to read regular updates from us on the news page (our blog). As well, we’ll soon be digging into social media and we hope you start following us at your local conventions. We’re also hard at work on a new edition of Wilderness Wars as well as some new side projects. Our business motto? Esse Quam Videri. That means “to be, rather than to appear”. We hope that this is what our site and the products we offer will convey to you. We’re very proud of this other fact: Wilderness Wars won Best of Theme when it premiered in 2001 at Little Wars, the midwest wargaming convention sponsored by HMGS Midwest. 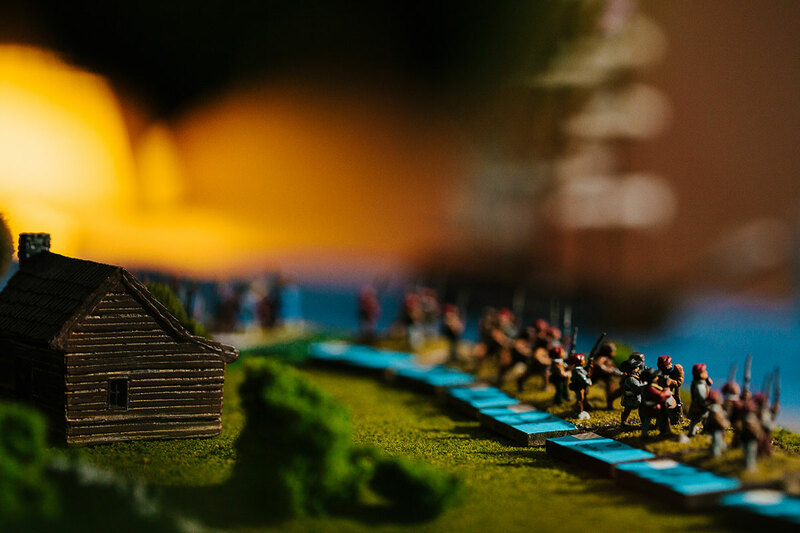 “Wilderness Wars” is a rule set designed for historical miniature warfare gaming in the 18th Century and the very early part of the 19th. This is one of the few rulesets for the company and battalion level of this era. And, while easy to learn, it is not simple. Strategies are key to success. We’re in the process of branching out into other fields and hope to share our work in progress with you soon. Thanks for the support. Please feel free to drop us an email any time.